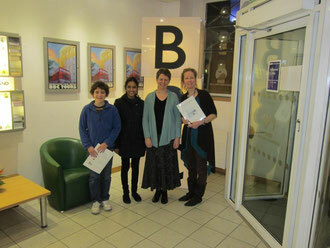 Neil McKane, Syamala Roberts, June and Andrea Rea of the BBC after the broadcast. On February 26th 2012, June and two of her pupils appeared on BBC Radio Ulster Sounds Classical with John Toal. Hear the interview below, which features pieces from Strangford Sketchbook, The Nine Glens of Antrim and Causeway Coast Fantasy.